I’m pleased that on Wednesday BBC2 launches a series that aims to improve the quality of service in Britain’s restaurants. It’s about time standards were raised, not only in catering, but throughout our leisure and travel industries. Isn’t it ironic, though, that the host of the imaginatively titled “Service”, Michel Roux Jnr, is a native of the country with the most aloof, indifferent, and unenthusiastic waiters in the world? I’m sure the staff in Le Gavroche are terribly polite, can polish cutlery to a sparkle and open silver domes in perfect synchronicity, but there are only two places where I’ve consistently found people on the other side of the menu who genuinely care about their customers: Los Angeles and the north east of England. Sure, with some exceptions, waiters in our part of the world have precious little training in the niceties of restaurant etiquette – many don’t know which side to set a wine glass – but at least you’ll be greeted with a genuine smile, nothing will be too much trouble and, even though you’ll be interrogated about your life story before you’ve been offered a bread roll, you’ll leave with a warm glow and an exhortation to have a nice day. In LA they do the same, but expect a 20 percent tip in return. Happily, I divide most of my time between these two locations, so when I tell you that this week I experienced the ultimate in good service, I write with some authority. It happened not in a restaurant, but at the British Airways check-in desk at Los Angeles airport. It started when Izzy dropped her dummy. It normally takes her about 45 seconds to progress from “uh-oh”, via a shriek of “Binky!”, to a full scale eruption. However, no sooner had the offending item – which we only use for emergencies like travelling in public – hit the terminal floor, than a wonderful institution called Philip Williams, who has run BA’s customer service operation there for more than thirty years, leapt across the baggage conveyor, snatched it up and rushed off to wash it in the staff restroom. We gazed at his departing form in shock: Philip has looked after every celebrity on the planet as they pass through his exclusive VIP lounge – now he was washing our child’s dummy. “How old is Izzy?”, he enquired, having restored clean binky to grateful mouth. When we revealed that she turned two later that very night, he frowned and studied his computer. We had planned our itinerary carefully: we wanted to stay in the sun as long as possible – sorry, England, but this weather is beyond a joke – however children can only travel on their parents’ laps till their second birthday. So the cost of staying just one extra day would have been a first class ticket for her: more than $8,000. Oh, and before I’m accused of being a secret banker, you should know that our own flights were virtually free, courtesy of some soon-to-expire air miles. Fifty thousand dollars worth of tickets for the cost of one economy return. We had to use them or lose them, so we were going home in style. “In English time, she’s already 2 years old”, Philip calculated, “so of course she must have her own seat”. With a few dexterous taps on the computer, he rearranged the first class cabin, moved the celebrities and businessmen to the back, and, free of charge, created a private nursery for us at the front of the plane. To be honest, I think Philip realised that the consequence of Izzy not having her own seat would have been far worse for the other passengers. Nobody would have got much sleep with Izzy trying to squirm her way off our laps for ten hours. After a couple of hours playing on the floor, Izzy fell fast asleep in her first class bed, complete with goose down duvet and pillow, clutching her favourite toy Baa-Bo. It’s an absurdly cute sheep made by Cheeky Moo, a tiny family business in Boldon Colliery. Which, by coincidence, is just a few miles from Birtley: birthplace of the wonderful Philip Williams. I mean, with service skills like his, where else could he have come from but the north east? HAHAHA Love that story. 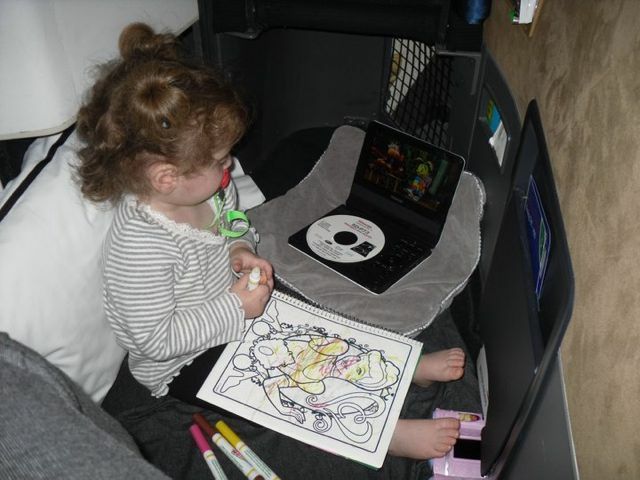 If they looked after the kids better on flights then everyone would be happier. Izzy looks so comfortable. Love your comments on north east restaurants. We have an Indian restaurant who are so helpful it's embarrassing. I'm sure they would help you eat your meal if they felt you needed it! Customer service seems to be a lost art. I wish I could travel first class and be treated as well as a 2-year-old.